Book a daytime Speckle Trout charter or air boat Redfish bow fishing charter with us and experience the Bayou like never before! We offer modern log cabin accommodations with your charter in the middle of a 200-year-old fishing village. 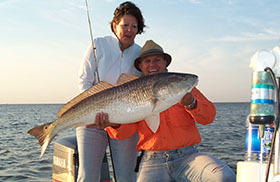 You'll be on the water where you can enjoy some of the best saltwater fishing in Southeast Louisiana. 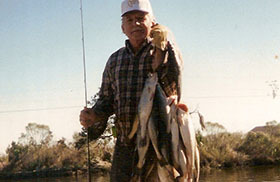 We can arrange daytime nighttime fishing charters or swamp tours with our knowledgeable and experienced guides. We're ready to make your vacation with us one that you'll treasure forever! Perfect for the whole family, our team will help you have an amazing experience whether you are a seasoned salt-water fisherman or have never cast a line before in your life. Plus you can stay in our cabins and enjoy the ultimate on-the-water experience! The beauty of the Bayou is waiting here for you! 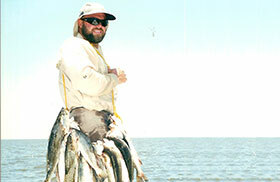 Unlike other fishing charters companies, you won’t be staying in a hotel, waiting to get out and experience the water. Bayou Log Cabins offers modern, comfortably appointed log cabins right in the heart of the Bayou waters. That means you can settle in and enjoy the Bayou day and night during your stay with us, and we’ll make sure you enjoy every minute. 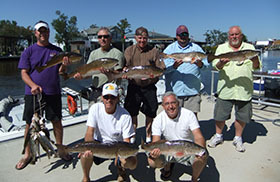 Arrange for daytime or nighttime fishing charters, airboat rides, swamp tours, and more. You’ll get to fish right alongside our experienced captains as they give you the very best of the Bayou experience with some of the best salt-water fishing in North America. Contact us today to and check out our log cabin rentals!